Ernest Reginald Diment was born in 1888 in Yeovil, the son of miller's carter James Albert Diment (1864-1935) and Emily née Sharp (1861-1949). In the 1891 census James and Emily were listed living at 19 great Western Terrace, with three-year-old Ernest and his 10-month-old brother George. By 1901 the family were living at 16 Camborne Street. James gave his occupation as 'Miller's Engine Driver' while 13-year-old Ernest was listed as a 'House Painter's Apprentice'. The family now included a further two daughters and another son. By the time of the 1911 census Ernest had joined the Royal Navy, Service Number 222049, and the census listed him as an able seaman at the East Stonehouse depot, Devonport. His parents meanwhile had moved to 39 Camborne Street. In the spring of 1916, at Yeovil, Ernest married Beatrice Williams. However he was shortly to return to his ship. Sadly we know little of Ernest's early career in the Royal Navy although by 1916 he had achieved the rank of Petty Officer and his badge of rank is shown at left. He served aboard HMS Indefatigable. HMS Indefatigable was a Royal Navy battle cruiser and the lead ship of her class. Her keel was laid down in 1909 and she was commissioned in 1911. She was an enlarged version of the earlier Invincible class with a revised protection scheme and additional length amidships to allow her two middle turrets to fire on either broadside. Indefatigable was sunk on 31 May 1916 during the Battle of Jutland. Part of Vice-Admiral Sir David Beatty's Battle Cruiser Fleet, she was hit several times in the first minutes of the "Run to the South", the opening phase of the battle cruiser action. Shells from the German battle cruiser Von der Tann caused an explosion ripping a hole in her hull, and a second explosion hurled large pieces of the ship 200 feet (60m) in the air. Only two of the crew of 1,019 survived. Ernest, aged 29, was killed as a direct result of this enemy action but his body was not recovered. Another Yeovil man killed on the same day at Jutland was Ordinary Seaman Ernest Cox who went down with HMS Black Prince. On 9 June 1916 the Western Gazette reported "Another Yeovil man who went down with the Indefatigable was First Class Petty Officer NS Ernest Diment, son of Mr and Mrs Diment, of 39 Camborne Street. He was married in Yeovil about three months ago. Deceased had been in the Navy for some years." 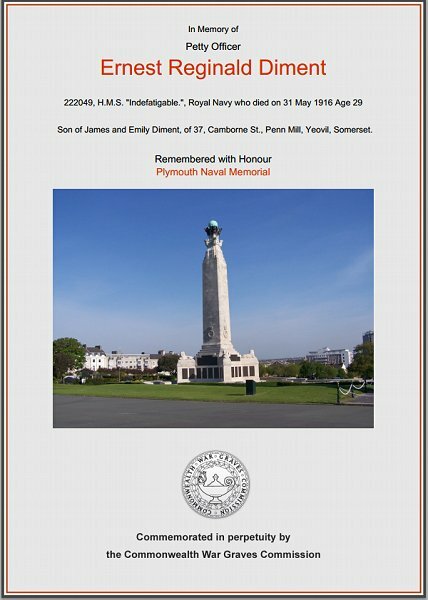 Ernest Diment's name is recorded on Panel 11 of the Plymouth Naval Memorial and on the Yeovil War Memorial in the Borough. The Commonwealth War Graves Commission certificate in memory of Ernest Diment.